Where are The Marble Baths? 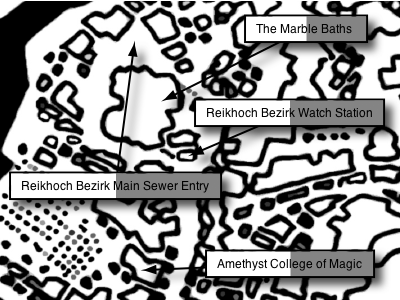 As a follow up to the presentation of The Marble Baths comes the map pin-pointing its location in the Reikhoch Bezirk, close to Westenstrasse. Don’t have a clue where the Reikhoch Bezirk is? Click here to find out! It’s number 13 on the map. Previous Article What’s the weather like?